They first appeared in 2013 when “God’s work. 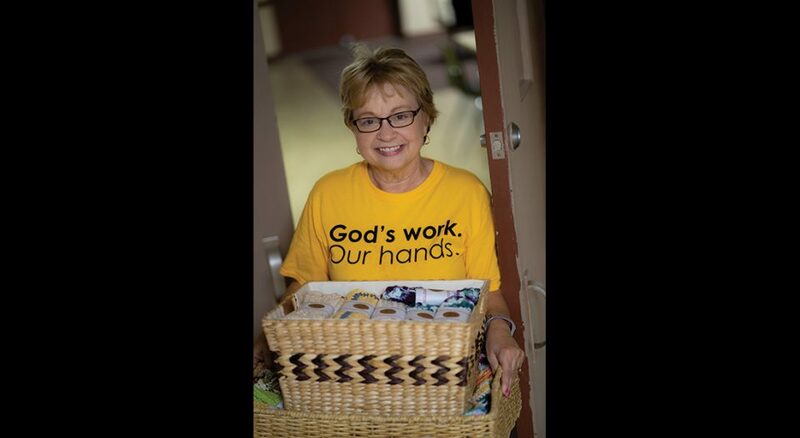 Our hands.” Sunday, a national day of service for ELCA congregations, was introduced. 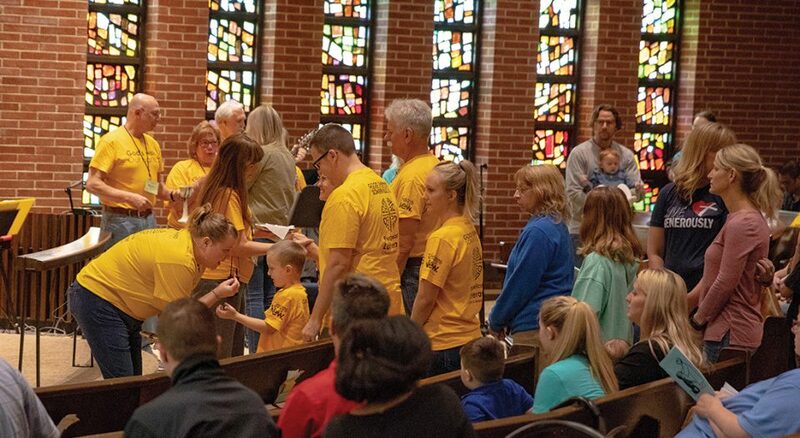 While the T-shirts aren’t necessary for participation, they’ve become a sort of visual symbol for the unity experienced across the church on that Sunday in September when congregations gather for service. This year, ELCA congregations around the country celebrated the fifth anniversary of “God’s work. Our hands” Sunday by once again going out into their neighborhoods to meet needs in their communities and form relationships with people who might not typically come to their church. In her video invitation to congregations, Presiding Bishop Elizabeth Eaton said the service day is “an opportunity to celebrate who we are as the ELCA—one church, freed in Christ to serve and love our neighbor.” And how that’s lived out is just as varied in creativity and mission as the number of congregations that participate. Faith Lutheran Church in Lander, Wyo., started participating in “God’s work. Our hands.” Sunday in 2013 with a variety of service projects around town. 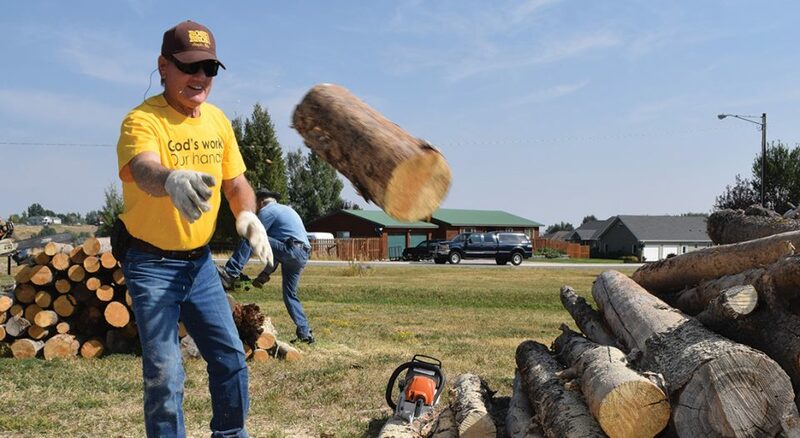 Three years ago, they added an activity to their service day when members Hart and Josey Jacobsen had to cut down a lot of trees on their property that had been killed by the pine bark beetle. “We had a lot of wood that had been cut, and I thought this would be a real opportunity to make use of it and distribute it to those who would need it,” said Hart Jacobsen, referring to many in the area who use wood-burning stoves to heat their homes during winter. 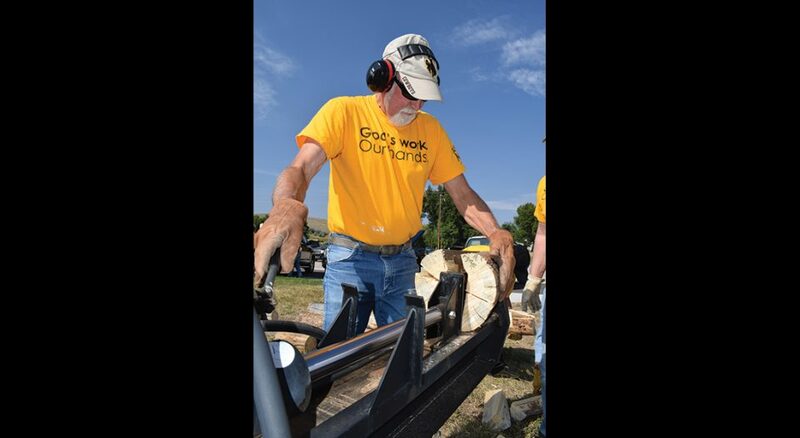 About a month before their service day, members of Faith go to the Jacobsens’ property with pickups and trailers to spend a day cutting and sizing the wood to haul it to the vacant lot next to the church. Then on “God’s work. Our hands.” Sunday, people come with chainsaws and wood splitters to cut the logs into fireplace-sized lengths. “This year we had about two dozen people—all ages, men and women, and even some people who aren’t members of the church who just live in the neighborhood and showed up to help,” said Mark Moxley from Faith. For the past couple of years, a pastor from a nearby reservation also has come with others to help with the project. Moxley estimates the congregation has at least five cords of wood (one cord is a well-stacked woodpile about 128 cubic feet in volume) by the time they’re done stacking it. Some of it gets distributed to older parishioners who might have trouble acquiring wood, some goes to families who live on the reservation, and the rest is distributed or picked up as members hear of people who need wood for the winter. On its service day, Grace Lutheran Church in Lancaster, Pa., hosts a community cookout. A few weeks leading up to the event, members canvass the neighborhood with news of the cookout, hanging door hangers written in English and Spanish, and extending personal invitations to people they meet. Steve Verkouw, pastor of Grace, said a variety of people attend—some live in the neighborhood, some are homeless and know about Grace from a weekly meal it hosts, and others are from groups with whom Grace shares its building. This year 150 people attended. On the day of the cookout, members set up stations, grilling hot dogs in the parking lot and welcoming people. Parishioners and people from the neighborhood bring side dishes and desserts to share. Favors are handed out—this year it was handmade dishcloths wrapped with a label that said “Handmade with love,” along with information about worship times at Grace. Along with human needs, “we want to let them know we’re here for spiritual needs too,” Verkouw said, adding that members often make deliberate efforts to connect with the community. “The cookout isn’t so much a special event but more a celebration of what we’re always trying to do,” he said. Andersen said it’s inspirational to see what other ELCA congre­gations do on “God’s work. Our hands.” Sunday, and she hopes that Grace’s story can be an inspiration to those who might be able to host something similar. “What’s so wonderful is that during this meal, everyone is so equally a child of God,” she said. “No one knows who is who or what their station in life is. Everyone is just having a great time together. Several congregations gather with other faith communities in their area for “God’s work. Our hands.” Sunday. For five years, five ELCA congregations in Colorado Springs, Colo. (Grace, Ascension, Christ the King, First and Prince of Peace), have joined together for the day of service. Cathy Irwin, a member of Grace who helps coordinate the projects, said representatives from each congregation meet in the summer to find and recommend activities for the day of service and choose activities that represent a citywide need. This year, 138 people from the five congregations participated in 13 service projects around the city, including assisting at a food pantry, helping at local nonprofits and a community center, and making sack lunches for people who are hungry. Each activity had a leader and members from all congregations represented. Good Shepherd Lutheran Church in Somerville, N.J., has participated in “God’s work. Our hands.” Sunday for several years, and this September one of its service projects helped connect members to neighbors they’ve never met. Stamp Out Despair is a program of First Friends of New Jersey and New York, an ecumenical nonprofit organization. 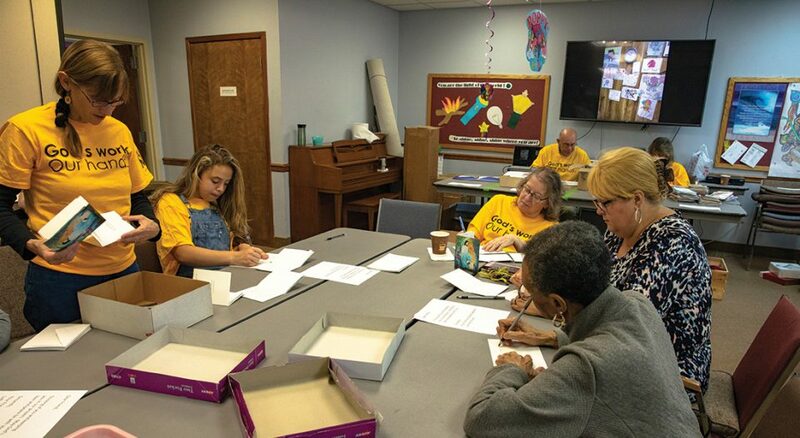 For the project, congregation members filled 230 folders with correspondence materials to be given to people being held in a New Jersey detention center. The folders all contained lined paper, colored paper, greeting cards, some stamped and unstamped envelopes, a pen and a hand­written note from a member of Good Shepherd. Good Shepherd had several service projects in addition to Stamp Out Despair organized for its Sunday, and more than 100 people from the congregation participated. For some congregations, “God’s work. Our hands.” Sunday serves as an introduction to outreach ministry. 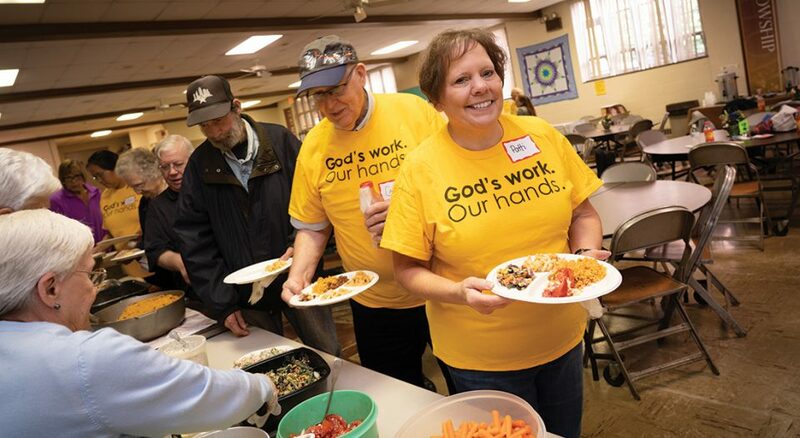 When Grace Gravelle was called as pastor of West Union Lutheran in Cologne, Minn., in January 2018, she found that the congregation had never really engaged in service or activities with their neighbors. “I started having conversations with them about how we can reach out and be a blessing to the community and welcome people,” she said. 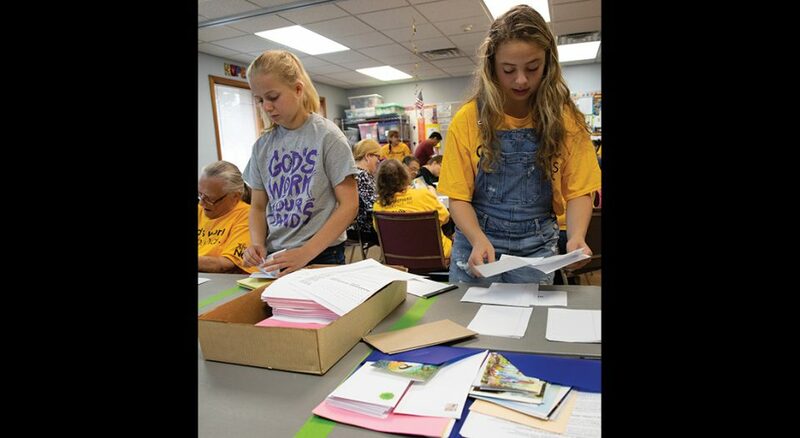 When she suggested participating in the ELCA service day, Gravelle said the congregation was a little nervous because they had never heard of it before, let alone participated in it. But they were eager to try something new. They ordered the yellow T-shirts and Gravelle made flyers that listed information about West Union and invited people to some upcoming events. On their service day, West Union’s members filled goody bags with candy and homemade cookies and delivered them with the flyers to different places in town—the nursing home, the police station and to people from church they hadn’t seen in a while. Member Jason Johnson made deliveries with his family around their neighborhood. He knew his daughters would love the activity but was a little hesitant himself. “My family and I love to participate in church activities with our church family and friends, but to be honest, I’m not very good at talking with strangers,” he said. Gravelle said the congre­gation is now looking at other ideas of how they can engage their community, such as delivering lunches to farmers in the fields and making sure people know about their Sunday school programming. When congregations participate in “God’s work. Our hands.” Sunday, they’re contributing to something bigger than themselves that helps create relationships in the world, said Ruben Duran, ELCA director for congregational vitality. Duran said the ELCA’s service day is also a way to discover what God is doing in the world through others—to become “detectives of divinity” and see how people are always doing God’s work in the world, even if they don’t call it that. “God’s work. Our hands.” Sunday is a day of service that’s made special because it’s an intentional effort to unite ELCA congregations around the country, but Duran said it’s also an extension of what Lutherans are already doing and are called by God to do—to care for the well-being of the world. In five years “God’s work. Our hands.” Sunday has grown from an innovative idea to an emerging valued tradition. 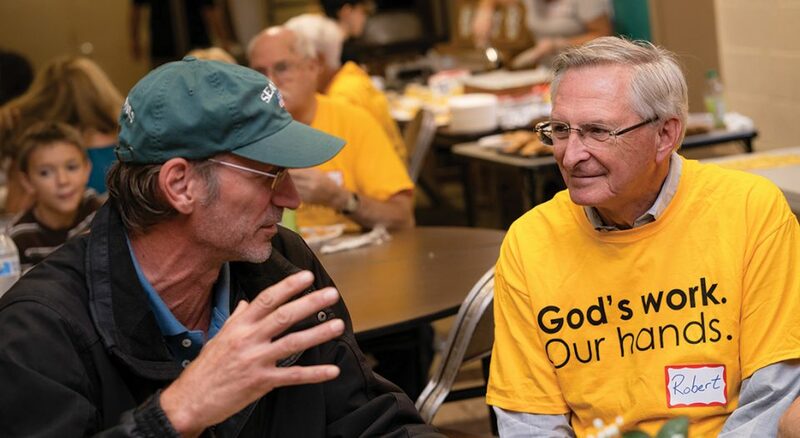 You see the trademark bright yellow shirts as Lutherans organize to serve their neighbor, embody the love of Christ and witness to the gospel. The Sunday also provides visibility for our churches and helps everyday Lutherans deepen their discipleship.